Check and record pressures above and below alarm valves before testing alarms. Test hydraulic alarm by opening 15mm test valve. Check and record pressures above and below alarm valves after testing alarms. Ensure main stop valve is locked open and that all ancillary valves are in the correct orientation. Carry out a visual inspection of system for leaks/defects etc. Ensure water storage tank is full prior to testing the pumps. Check fuel level before and after testing and top up where required. Check all pumphouse valves are in the correct orientation. Check battery electrolyte levels and specific gravity. Test jockey pump cut in and cut out pressures via the test facility and record the pressures. Test electric pump cut in pressure and record the pressure. Run pump for a minimum of 10 minutes checking to ensure water is flowing freely from the minimum flow line. Record delivery pressure and visually check pump for leaks, vibration and other defects. Stop pump and restart with manual start if applicable. Stop pump and ensure that supply healthy lamp is illuminated. Test diesel pump cut in pressure and record the pressure. Run pump for a minimum of 30 minutes checking to ensure water is flowing freely from the cooling line/minimum flow line. Monitor engine temperature, oil pressure and cooling system whilst pump is running. Record delivery pressure and visually check pump set for leaks, vibration and other defects. Stop pump and restart with manual start and run for a further 2 minutes. Stop pump and record hours run as detailed on the meter. Ensure that panel and battery chargers are functioning correctly. Please note it is not recommended to leave pumps running whilst unattended. Check cut in and cut out pressures and oil levels of any air compressors. Check any heating systems (including trace heating systems) are working. (Note if TFIS carry out weekly testing only a visual check of operational lamps is made). Check any storage tanks, rivers, canals, lakes, reservoirs and priming tanks are full of water, any contents gauges are operational, any ball valves operational and infill valves are secured open. Check air/water levels and pressures of any pressure tanks and any sight glasses are redrained and isolated. Check any automatic monitoring signals received and reset. Check there is the correct clear space below sprinklers. Check the availability of spare sprinkler heads. Inspect all pump pressure relief valves. Check life safety monitoring panels are operating correctly. 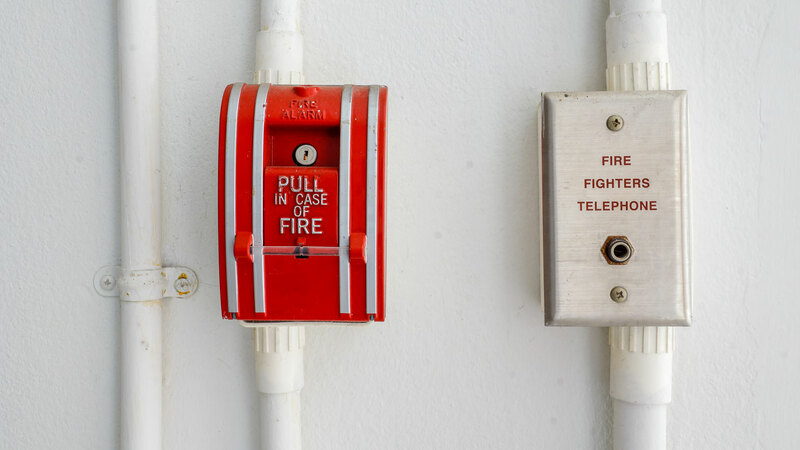 Check monitored fire brigade connections for continuity.